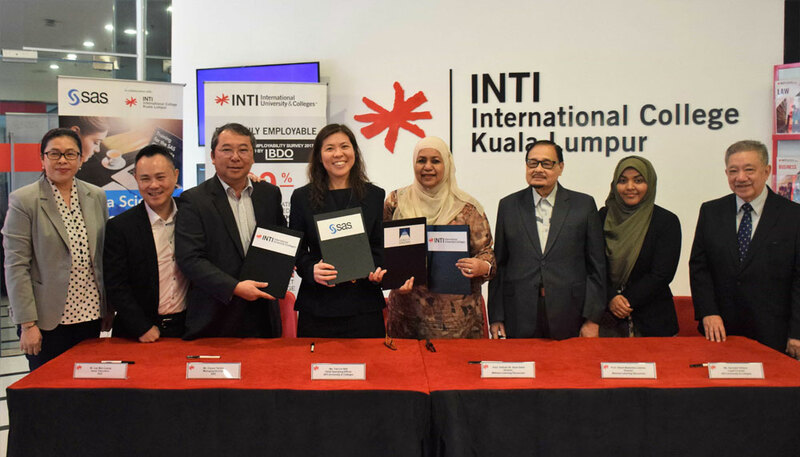 INTI International University and Colleges (INTI) has inked a Memorandum of Agreement (MoA) and a Memorandum of Understanding (MoU) with SAS Institute Sdn Bhd (SAS), Direct English, and Hilton Malaysia. 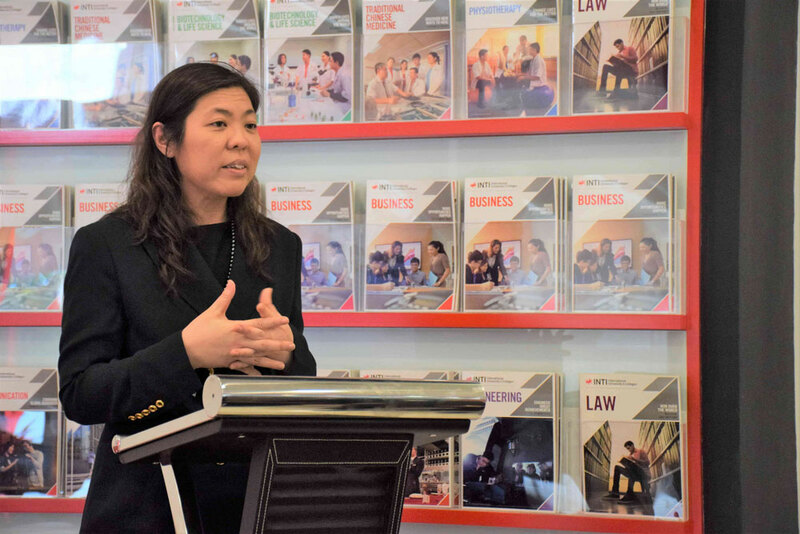 Tan Lin Nah, Chief Operating Officer of INTI International University and Colleges, presenting her speech at the MoA signing ceremony with SAS Institute Sdn Bhd and Direct English. The formalization of these new partnerships is a holistic opportunity for students to develop diverse competencies such as data analytics, language proficiencies, and developing five-star hospitality based skills set, which complement the theoretical knowledge they will gain during their studies. INTI’s collaboration with SAS Institute Sdn Bhd (SAS); presently a leading organization in predictive and advanced analytics, will also look at graduates preparing to meet Malaysia’s current needs of increasing digital talents. “Given Malaysia’s intent on producing an estimate of 20,000 data professionals by 2020 , our collaboration with INTI is a timely and pivotal one, as this initiative seeks to expand the pool of data and tech-savvy professionals within Malaysia,” states Cheam Tat Inn, Managing Director of SAS Institute Sdn Bhd. Anis Laila, Chief Executive of INTI International College Kuala Lumpur, further chimed in by stating that the SAS short courses will also be accessible to members of the public, regardless of prior expertise or knowledge in data science, to ensure everyone who is keen to expand their competencies can receive quality education. Similarly, INTI’s agreement with Direct English will also see English language proficiency courses being provided in INTI’s KL campus. Despite English being taught and used in primary schools all the way up to tertiary education, many graduates today still struggle with mastering this global language, making it a challenge for Malaysian employers to hire new graduates. “INTI’s agreement with Direct English will seek to meet the needs of Malaysian employers by building on graduates’ communication skills and raising the language proficiency, giving them the edge they need to be employable,” reassures Tan Lin Nah; Chief Operating Officer of INTI International University and Colleges, in her speech during the MoA signing ceremony. Following the theme of employability, hospitality and tourism students from INTI will also receive opportunities to build on their technical expertise as INTI’s MoU with Hilton Malaysia will look at providing five-star workshops to these students, empowering them with the standards and quality expected by the globally renowned brand. The practical experiences gained and collaborations with industry partners such as SAS, Direct English and Hilton who are leading pioneers in their industry, are part of INTI’s efforts to create work ready graduates in a highly competitive workplace and empower them with an edge for their future careers. Through such efforts, INTI continues to produce validated graduate outcomes which this year were recorded at 99% of INTI graduates securing jobs within 6 months of graduation, 60% getting job offers even before they graduate, and 91% earning salaries above the minimum market average.